Phubbing is phone-snubbing. It happens when someone pays attention to their mobile phone instead of the people in their immediate presence. Many of us are guilty! We’re also guilty of excusing our companions when they reach for their phone while in mid-sentence and still looking us in the eye. Alex Haigh, an Australian graduate student, aims to help society catch up. His satirical “Stop Phubbing” campaign has gone viral. He aims to make a serious point with his humorous use of contrived data. · If phubbing were a plague, it would decimate 6 Chinas. 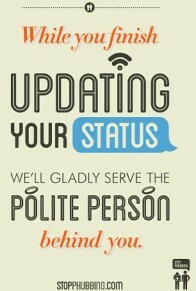 · 97% of people claim their food tasted worse while being a victim of phubbing. · 91% of repeat phubbers go on to be politicians. · 87% of teens would rather communicate via text than face-to-face. Haigh’s website includes a number of tools that can be used to help stamp out phubbing: a decal that advises, “Leave your phone in your pocket and have a chat in the real world”; an e-mail template that can be used in a “phubbing intervention”; a “Phubbing Hall of Shame” where pictures of phubbers can be uploaded. On a more serious note, the problem of phone etiquette was raised recently by the ever-thoughtful Mark Mitchell, co-founder of the Front Porch Republic website. In an article entitled “Real Presences,” Dr. Mitchell encourages us to consider the “implications of our cultural obsession with that small screen in our pockets.” He goes on to argue that embodiment is the main issue, though etiquette may be the place where the discussion begins. As embodied creatures it would seem that embodied encounters should be our default mode; however, it seems as if many are quite willingly exchanging the primacy of embodiment for a “reality” that leaves actual bodies behind. But does reading a book do anything different? I can escape the present by means of a book just as I can escape by means of a smart phone. Strange, though, how ubiquitous the device has become. Something about it is more alluring, more persistent in its beckoning, than a book. Perhaps it is the speed of movement whereby we can flit from one image to the next, one topic to another, with no continuity, rationality, or commitment. Our technology allows us to be promiscuous in our attention. Even the ubiquity of texting over talking seems to indicate a strange preference for digital communication over voiced communication. Voices, human voices that is, are the direct product of embodiment. In a particular voice we can hear the distinct variations and characteristics that indicate the person “behind” the voice. We can hear the pitch, the tremor, the irritation. We can even hear a smile. We humans are vocal creatures, and our voices are the primary means by which we communicate ideas, affections, feelings, and aspirations. By-passing voiced communication by means of text messaging may not be a big deal unless we come to prefer the one over the other. That is, unless we come to use texts as a means to avoid encountering another voice. Doing so would seem to represent one more step in our retreat from embodiment. But in my self-satisfied smugness, perhaps I am not as innocent as I pretend. I am sitting with my laptop, typing away, checking email whenever I hear the happy sound alerting me that a new message has arrived in my inbox. I tell myself that I’m not like those youngsters with the smart phones, but my laptop distracts me, enthralls me, in ways not unlike a smart phone. I tell myself that working from home, sitting on a couch, allows me to be present, but does it really? I attend to the screen while four beautiful children and their beautiful mother inhabit the background, only partially seen or heard. What opportunities am I missing? What am I teaching them about my priorities? Dr. Mark T. Mitchell’s “Real Presences” can be found online at The Front Porch Republic. Slightly different versions of the eBay Deals infographic are available here and here. “Phubbing: the war against anti-social phone use” appeared in The Guardian. “Why the ‘Stop Phubbing’ Campaign Is Going Viral” is available at TIME.com. For the “Stop Phubbing” website, go here.